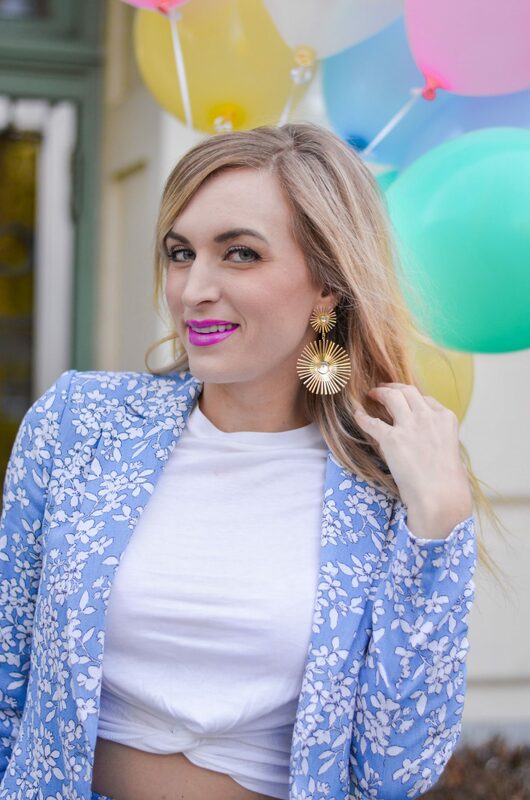 Meet my birthday suit… this gorgeous floral blazer and shorts set! What did you think I meant by birthday suit!? Haha! Yesterday (April 7th) was my birthday; I’m now 33, and am stoked to be ringing in age 33 in this Alice & Olivia floral blazer and shorts suit set. It’s still hard for me to believe I’m 33, I definitely feel like the past 5 years have gone by in the blink of an eye. I was struggling pretty hard this week about turning 33 and not feeling like I am where I want to be for 33. I knew it was up to me to get myself out of the mood I was in and focus on the amazing things I do have in my life. When I woke up to a gorgeous sunny day yesterday despite the weather network calling for rain all week, I was overjoyed. I genuinely almost cried when I walked outside first thing in the AM to get some coffee and saw that it was sunny and warm. I spent the day at the beach with some of my closest girlfriends and we just ate junk food, drank cocktails, and soaked up the sun. I then had dinner with my dad who was in town from Ontario which was so great. I love spending time with him, he’s such an inspiration and is such a cheerleader for my blog, despite not really knowing how any of this blogging world works lol. I was telling him about what is next for LegalLee Blonde – and he approves of the next step. I am so excited to tell you all about it -which I hope to in the next month or so! Alright, on to a quick discussion about my epic birthday suit! I love finding suits with shorts. Clearly not something I am going to wear to court, but I think everyone needs a shorts suit set in their wardrobe for days when they’re out and about and want to bring some confidence into their outfit. You can’t beat the confidence that comes from a suit. This gorgeous Alice & Olivia set caught my eye because of the pattern. I love the white floral on top of the sky blue. There is also an Alice & Olivia a-line mini dress in this fabric (which I’ve linked up in the ‘shop the post’ widget below in case dresses are more your jam!) One thing to note – size up in the Alice & Olivia shorts. I am normally a size 4/6 but went with a 6 in the shorts and even then they are a bit tight. I do love the fit through the hips and thighs though – they skim without being too tight! One random question for you – what year has been your favorite ever? I’ve heard a lot of people over 35 say 33 or 34 was their favorite, and I’m wondering if that’s a common response!? Age 13 – I switched to a new school for the 8th grade, and loved it. I became best friends with Maddie (my still best friend today) and began focusing much more heavily on my dance classes, which turned into a huge passion for me, and arguably the thing in my life that has most shaped who I am as a person. Age 16 – I was that girl who loved high school. I loved the structure of school and loved all my after school activities. I got my license this year and having the added independence that came with that was amazing. This was also the year I started working in the summers as a camp counselor, which was a job I loved and did all through high school and university. I also spent Christmas break this year with my boyfriend and his family in Thailand which was an incredible experience. Age 22- This was the year I graduated university and moved to San Diego to work for the non-profit Invisible Children. My boyfriend of nearly a decade (we started dating when I was in grade 9 and he was in grade 11) broke up this year, but it was one of my best years because without him, I learned (for the first time) how to be an adult on my own. "Tied Blazer & Stressing About My Birthday"
"Everything You Need to Know About the Ted Baker Warehouse Sale in Vancouver"
What an adorable birthday suit! Happy Birthday Babe! This is the cutest suit! I absolutely love the color and print, so perfect for Spring! Happiest of Birthday’s gorgeous! I am loving the birthday suit, the color is super pretty! Happy belated Birthday! You had a lovely Day!! And looking gorgeous of course! Loved to read your favorite years! Like to read more! Hope your week is going well so far 🙂 It’s a crazy busy week here! Happy Birthday girl! I hope you have the best year yet! And this suit looks amazing on you! I don’t think anyone’s life really goes according to plan. I know I thought I would have accomplished more things by the time I turned 34…haha. I totally understand not feeling where you want to be at this age. I always thought I’d have an amazing career but I’ve never even been able find a full time job…lol. I think you are doing awesome for 33 and should totally celebrate it! Thank you so much! And ah that’s so true – i think we all have set ideas in our brains about certain ages, and ya it makes sense that noone has every single thing they thought they would at age X.
Aw Happy Birthday! I love your suit separates and think you look just beautiful! Happy Happy birthday! Your birthday “suit” is gorgeous! Dear Lee, I will pray that for the rest of your life you will stop being so harsh on yourself. You are a very beautiful, self made, professional, motivator, entrepreneur, fashionista, and a role model for young generations who are not using wisely their lives as you have been doing. 33 was a magic number for me. It was when I got married, started a family with 2 young boys and began the rest of my life, as a mature woman. Sometimes when we are young we make plans that do not come exactly as we expected, but those are the unexpected things in life that make us who we are. ENJOY your life, you are way ahead! FYI The 30’s are the best! Thank you so much for such kind words! That is so sweet of you to say. And sounds like 33 was amazing for you! Im hoping it will be for me as well 🙂 It’s definitely off to a good start! Happy birthday gorgeous! I love your suit, it looks perfect on you.